Bonjour Idée, the collaborative magazine of start-ups and the OCP Group held the first African edition of the African start-up contest of the year “Startup of the year / Africa 2017” on Jan 26, 2017. On the multitude of start-ups that have applied for this award, the jury has decided to take over ThinVoid from Uganda. The task was not easy for the jury of the first edition of the “Startup of the year / Africa 2017” which had chosen a start-up on the multitude of registered applications. But ThinVoid (Uganda), co-founded by Joseph Kaizzi, attracted the attention of the majority of the jury members who awarded it the start-up prize of the year. ThinVoid provides a service that promotes the financial inclusion of unbanked professionals in the transportation and agriculture sectors. An innovative solution in a country where the rate of banking is still low and where the products offered by the traditional financial systems are unsustainable for the poorest populations. At the same time, the Agritech OCP Special Prize was won by the start-up Zenvus. The Nigerian startup was founded by Dr. Ndubuisi Ekekwe and presented as an intelligent solution for farms that uses electronic sensors to collect soil data on moisture, nutrients and temperature. This helps to tell farmers on what, when and how to farm. The winner of the jury prize was awarded to the Guinean start-up, Fapel Guinee. A company specializing in the manufacture and marketing of reciprocating, domestic and irrigation reciprocating pumps. Thus, African youth continues to prove themselves. Solutions are proposed to solve the problems facing the people of the continent. Thus, this edition has seen the Audience Prize awarded to Mahazava (Madagascar). Founded by Christian Randriam, Mahazava is a start-up that finances, distributes and ensures the follow-up of solar kits in Madagascar. The start-up Trustin Africa (France), founded by Thibaud Leclerc and Etienne Morne whose objective is to accompany companies on the African continent or in the pursuit of their establishment, mainly in West and Central Africa, connecting them with the young local talents, won the Special price destination Africa SNCF. 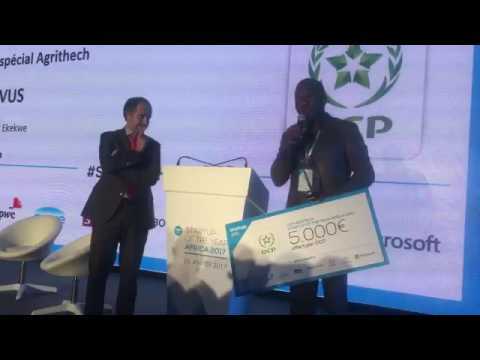 Similarly, EthicPhone, founded by Mouhamed Diakité and proposing a solution that makes it possible to call, to transfer money to Africa, to make purchases from a mobile phone and to invest in African SMEs, won the African Diaspora Special Prize from Microsoft.